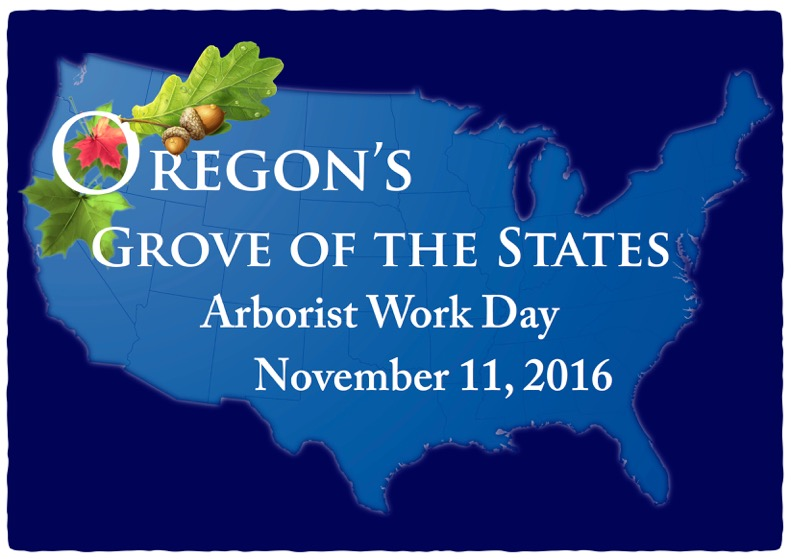 Located at the southbound I-5 French Prairie Rest Area (at Milepost 281 near Wilsonville) the Grove is believed to be the oldest public arboretum of state trees in the US and was originally a collection of trees from 53 US states and territories. When the Grove was planted in 1967, planners did not provide enough space for the new trees to grow into their mature height. Over the years, some of the larger species and encroaching Douglas fir trees out-competed their neighbors for sunlight and many of the trees became diseased, unhealthy, or died. 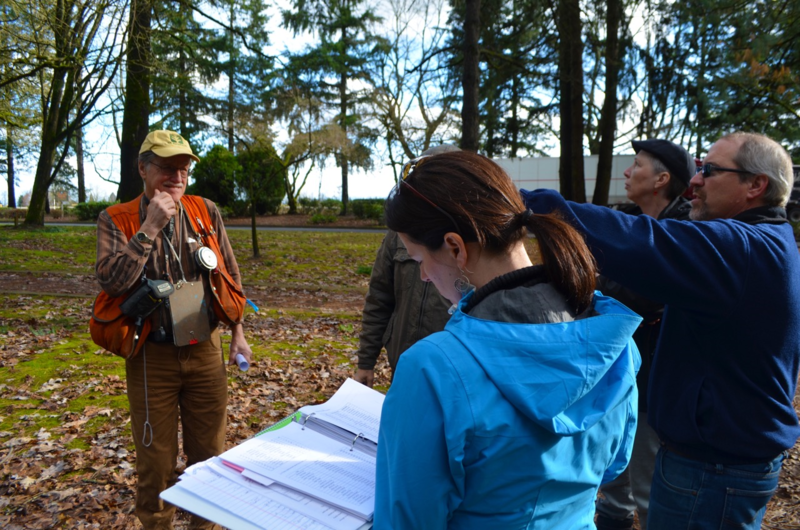 In preparing for the Grove’s 50th anniversary in August 2017, the Oregon Travel Information Council (DBA Oregon Travel Experience) and its partners at the Oregon Department of Forestry, Friends of Trees, and other tree lovers joined efforts to save the Grove for future generations. “The Grove is a unique collection of trees and needed significant help to bring it back to full health. The work performed by our volunteers is invaluable in restoring this important cultural and historical resource,” says Ries. Ries, who is one of the restoration project organizers, says that other work performed on the arborist’s work day will help expand the Grove’s footprint, and cleared the way for planting both new and replacement state trees. 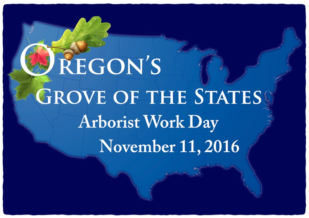 He added that many of the arborists volunteered for service days at other Oregon public greenspaces, including Portland’s “Arborists in the Arboretum” located at Hoyt Arboretum. ISA Board Certified Master Arborist Lyle Feilmeier is one of the GOS work day volunteers. “Our work day at the Grove demonstrates a way to give back community,” he says. Feilmeier is the local manager for Bartlett Tree Experts, a national company that recently set roots in the Pacific Northwest. He indicates that the Grove represents a unique opportunity to promote scientific aboriculture, and at the same time, teaches both young and old about other important tree species across the nation. OTE’s Annie von Domitz, the Grove’s restoration project manager, says that full restoration wouldn’t be possible if not for the hundreds of volunteer hours that the arborists and their companies have committed to. Von Domitz adds that other opportunities abound for those interested in preserving this important historical asset. “People who love trees or appreciate Oregon history can help us with the restoration by becoming a Grove of the States sponsor,” says von Domitz. “Sponsorships are available at all levels, including helping to purchase individual state trees,” says von Domitz. “We also have corporate sponsorships available, and local businesses can contribute to new Grove of the States interpretive signs at the rest area,” she adds. Sponsors will be acknowledged through signage in the rest area. To learn more about the in-depth history of the Grove of the States and its connection to Lady Bird Johnson’s Highway Beautification Act, visit our restoration project web page.